Recording lectures is the heart of LectureMonkey. There are 2 ways to record a lecture – fully automatic and audio only. In any case, the first step is to push the Record button on the main screen. After that LectureMonkey will ask for details describing the lecture you are about to record. If you leave the details blank, LectureMonkey will name the lecture using the current date and time. You can always change the details by editing the lecture later, after you have finished recording and saved the lecture. 1.Audio only – If you select , LectureMonkey will immediately begin an audio recording of the lecture. To include an image or video as part of the lecture, use the video\camera icons to capture a full screen image or video. 2. Fully automatic – This is most valuable use of LectureMonkey, using it to record the lecture automatically. You won’t need to do anything except pay attention to class – or add a comment or two. Lectures are stored in a very space efficient format (not video), so you don’t have to worry about space. An hour long lecture should take up only about 50MB of space. LectureMonkey uses high quality audio capture and processing to ensure your lecture sound perfect. The end result is a high quality “slide show” of all the images (presentations and whiteboards) along with synchronized audio, bookmarks and comments. You can go back to any image or point-in-time and see the board and hear exactly what was said. 2a. Set down the iPhone with the camera pointed at the front of the classroom, making sure that you can see everything you want to capture on the screen. You can have completely automated setup by just leaving your phone sit – LectureMonkey will beep and start recording the whole screen automatically in about a minute. This is a little less optimal then if you calibrated LectureMonkey for the presentations and boards. 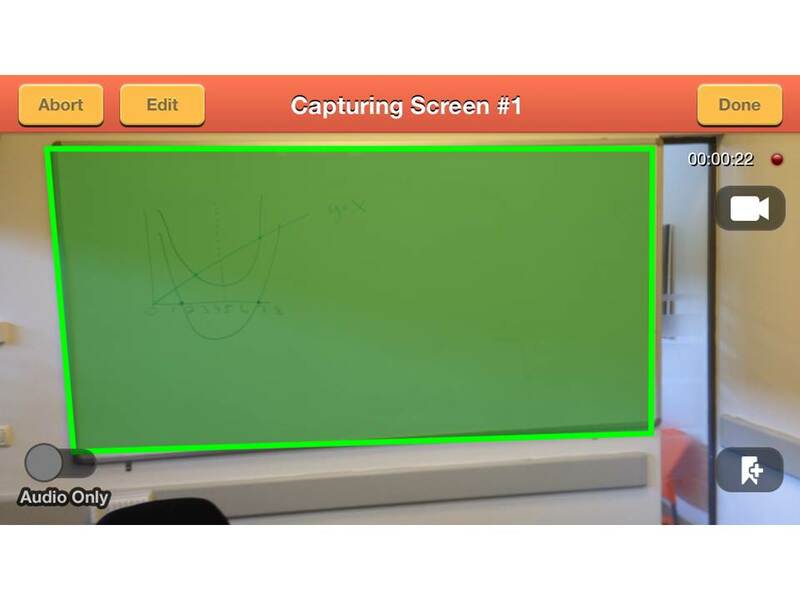 To calibrate LectureMonkey, touch the screen anywhere to take a calibration image. When calibration is complete you will see a green rectangle in the center of the screen. 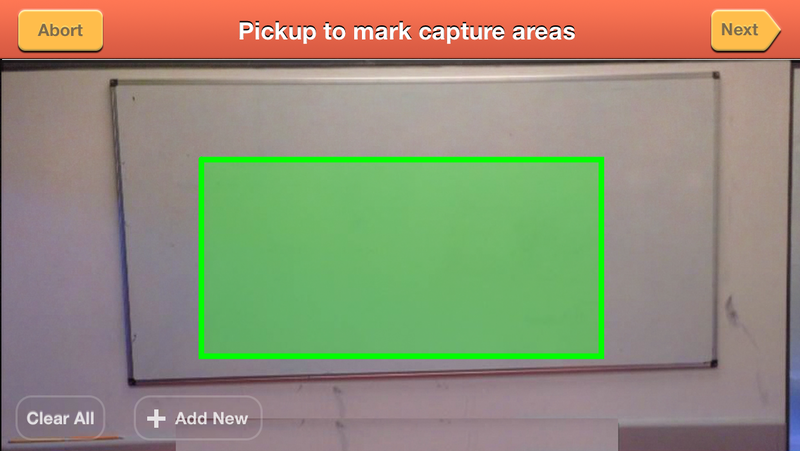 You can then pick up the phone to mark the capture areas. 2c. The areas you marked show up in green for presentations and blue for boards. Use the rectangles as a guide to place the iPhone back in the correct position. 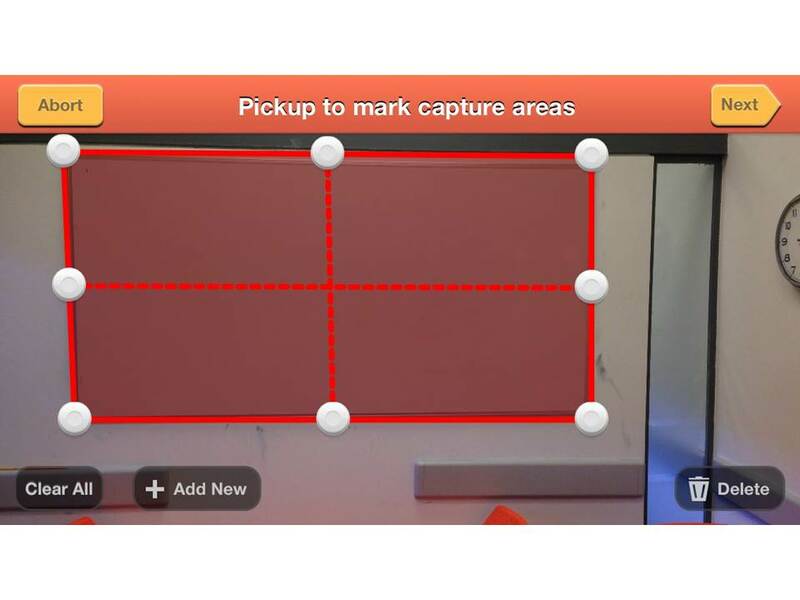 Don’t worry about being exact – just get the rectangles in about the same location – the capture process is forgiving and you can always to fix the images when you are done recording. 2d. LectureMonkey will start recording automatically a few seconds after you have set it down (or you can press next if you are in a hurry). It will flash a “Recording” notification when recording starts. You can also add comments while recording. Just pick up the phone (LectureMonkey will continue to record audio, but stop taking images), press the “add comment” button and type in your comment. This entry was posted in 1. Using LectureMonkey, Recording Guide. Bookmark the permalink.